There are a large number of common plants that are toxic to pets, but luckily cats and dogs rarely show an interest in them. The majority of dogs and cats, given the option, would rather snack on grass than toxic plants. Sago palms: Dogs are attracted to these woody plants, and many die each year after chewing on them (cats are also poisoned by sago palms, though not as often). 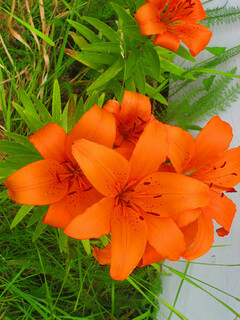 Lilies: Lillies are particularly toxic to cats – just drinking a little water from a vase containing cut lilies, biting a leaf, or ingesting a little pollen can kill a cat (dogs can get sick from consuming lilies as well, though it usually takes a greater amount). Given how dangerous sago palms and lilies are to pets, they’re not worth the risk unless they can be locked away in a room to which pets will never have access. Some toxic plants, such as poinsettias, can trigger relatively mild reactions (such as skin or mouth irritation and, in some cases, vomiting or diarrhea that resolves on its own). Although many people panic each year when their pets chow down on poinsettias, consuming small portions of these plants will not kill an otherwise healthy pet. Plants that may cause more serious toxic reactions include the following (toxic effects are varied, with some triggering more serious problems than others). If you believe that your pet has been poisoned, call a veterinarian or the ASPCA’s Poison Control Hotline, which is available 24 hours a day, 365 days a year: (888) 426-4435 (a $65 consultation fee may be applied to your credit card). If symptoms are serious, seek veterinary care immediately. If you’re unsure, err on the side of caution and consult a veterinarian. For a list of non-toxic plants, see the Pet-Safe Plants page. See Foods That Are Toxic to Cats and Dogs for more on toxic substances. The lists on this page cover some of the more common safe and unsafe plants. For an exhaustive list that includes hundreds of plants, see the ASPCA’s Toxic and Non-Toxic Plants Lists. ASPCA. (2009). “17 Poisonous Plants.” ASPCA.org. CCA-AFC. (2006). “Toxic Plants.” CCA-AFC.com. Eldredge, D.M., DVM, Carlson, D.G., DVM, Carlson, L.D., DVM & Giffin, J.M., MD. (2008). Cat Owner’s Home Veterinary Handbook, Third Edition. Wiley Publishing, Inc.
Giffin, J.M., MD, & Carlson, L.D., DVM. (2000). Dog Owner’s Home Veterinary Handbook, Third Edition. Howell Book House.